A value of 1 indicates full membership in the fuzzy set, with membership decreasing to 0, indicating it is not a member of the fuzzy set. This tool does not scale categorical data. To include categorical data into fuzzy overlay analysis, a preprocessing step is necessary. You can create a model or run the following geoprocessing tools. First, use the Reclassify tool to provide a new range of values (for example, 1 to 100). Then Divide the result by a factor (for example, by 100) to normalize the output values to be between 0.0 and 1.0. Spread determines how rapidly the fuzzy membership values decrease from 1 to 0. The larger the value, the steeper the fuzzification around the midpoint. Said another way, as the spread gets smaller, the fuzzy memberships approach 0 more slowly. 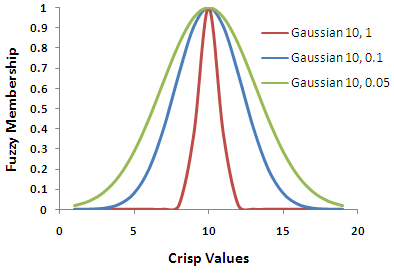 The selection of the appropriate spread value is a subjective process that is dependent on the range of the crisp values. For Gaussian and Near, the default value of 0.1 is a good starting point. Typically, the values vary within the ranges of [0.01–1] or [0.001-1], respectively. For Small and Large, the default value of 5 is a good starting point where, typically, the values vary between 1 and 10. Affect of spread on a Gaussian fuzzy membership. You may have a case where none of the input values have a 100 percent possibility of being a member of the specified set. In other words, no input value has a fuzzy membership of 1. In this situation, you may want to rescale the fuzzy membership values to reflect the new scale. For example, if the highest membership for the input values is .75, you can establish the new scale by multiplying each of the fuzzy membership values by 0.75. The hedges implemented are Very and Somewhat. Very is also known as concentration and is defined as the fuzzy membership function squared. Somewhat is known as dilation, or More or Less, and is the square root of the fuzzification membership function. The Very and Somewhat hedges decrease and increase, respectively, the fuzzy membership functions. Negative values are not accepted in the Small and Large membership functions. For the Linear membership function, the input raster must be ordered data. The minimum can be less than the maximum to create a positive slope or greater than the maximum to create a negative slope for the transformation. If the minimum is less than the maximum, a positive-sloped function is used for the transformation; if the minimum is less than the maximum, a negative-sloped function is used. The input raster whose values will be scaled from 0 to 1. It can be an integer or a floating-point raster. Specifies the algorithm used in fuzzification of the input raster. The fuzzy classes are used to specify the type of membership. FuzzyGaussian, FuzzyLarge, FuzzyLinear, FuzzyMSLarge, FuzzyMSSmall, FuzzyNear, and FuzzySmall. Defining a hedge increases or decreases the fuzzy membership values which modify the meaning of a fuzzy set. Hedges are useful to help in controlling the criteria or important attributes. NONE —No hedge is applied. This is the default. SOMEWHAT —Known as dilation, defined as the square root of the fuzzy membership function. This hedge increases the fuzzy membership functions. VERY —Also known as concentration, defined as the fuzzy membership function squared. This hedge decreases the fuzzy membership functions. The output will be a floating-point raster with values ranging from 0 to 1. This example creates a fuzzy membership raster using the Gaussian function where elevation values closer to the midpoint (1,200 ft.) have a higher membership value. This example creates a fuzzy membership raster using the Gaussian function and a spread of 0.4, where elevation values closer to the midpoint (1,000 ft.) have a higher membership value.